The next time you visit a doctor’s office or medical clinic, take a moment to look around the examination room. Chances are you’re sitting on a table covered by Domtar paper, wrapped in a gown made with Domtar pulp and surrounded by disposable medical products and bandages that are wrapped in Domtar medical paper. The trend toward disposable medical supplies is driven largely by cost containment and infection control requirements. The trade publication Infection Control Today notes that healthcare institutions have to weigh the costs and risks of sterilizing and reusing medical equipment versus using disposable devices. Single-use devices offer the greatest protection against cross-contamination, which creates better patient outcomes and lowers costs associated with infection care. As a result, disposable medical supplies is a large, growing sector, and many of those supplies are packaged in or made with Domtar medical paper. Research has projected the global disposable medical supply industry will reach $198 billion in 2016, with emerging economies in areas with large patient populations and improving healthcare services. Medical paper products include the disposable gowns and drapes, bandage and instrument wrappers, wipes, pill packaging and paper seals that make up the bulk of Domtar’s medical paper business. Peter Gilbert, director of marketing for Domtar’s specialty paper group, notes that Domtar produces a significant percentage of the medical paper used by the healthcare industry. And all of that medical paper is produced at Domtar’s Port Huron Mill in Port Huron, Michigan, and Espanola Mill in Espanola, Ontario. Rod Tibboles, research and development manager at the Port Huron Mill, said the mill is one of just a few in the world that produce medical paper for gowns and drapes. That paper is sent to converters where it is hydroentangled (bonded using water jets) with polyester to create a non-woven fabric that can be cut and sewn or fused into gowns, drapes and other products. Indeed, a 2016 report about the global disposable medical supplies market published by QYResearch showed that disposable medical textiles make up the largest share of the market among the 10 product categories included in the study. That share is expected to continue growing thanks to the improved quality and performance of today’s non-woven disposable medical textiles. Overall, the report notes that the total global disposable medical supply market has averaged 7.5% growth annually. While other paper companies do produce medical paper, Domtar is uniquely positioned as a leader in the industry. 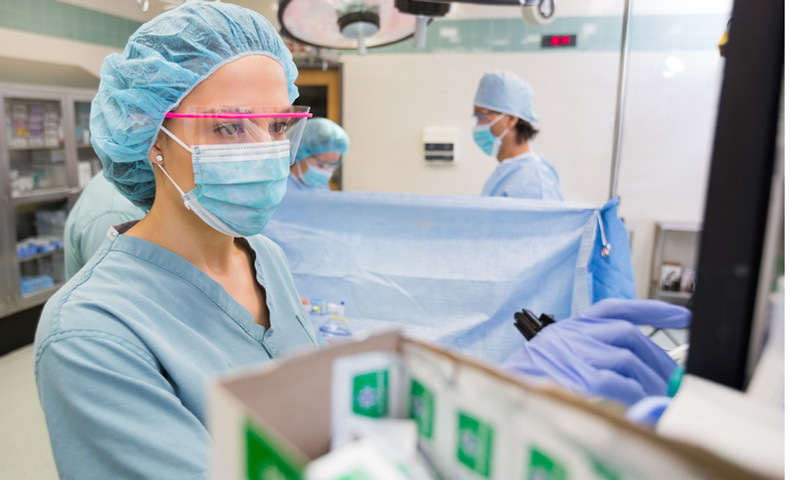 With several decades of experience producing bandage wraps, packaging, sterilizable kraft papers, and gown and drape papers for clinical settings and over-the-counter applications, Domtar understands the regulatory requirements and customer needs in a way few other manufacturers can. In addition to factors such as absorbency, breathability, cleanliness and ability to withstand a variety of sterilization processes, Domtar’s medical papers must be consistent in thickness and color, both during a single manufacturing run and from batch to batch. Domtar also ensures the color-fastness of all of its dyes. So the next time you tear open a bandage or pop a pill through the paper on the back of a blister pack, think about the decades of experience and research that went into producing that paper – and the Domtar colleagues who work every day to make sure that paper is ready when you need it.